Create Table using Range object and define no of rows and columns. Enable the borders of table using table object. Thank you for this great post, it helped me a lot! Thank you very much,, really helped alot. Glad that it was useful for you. 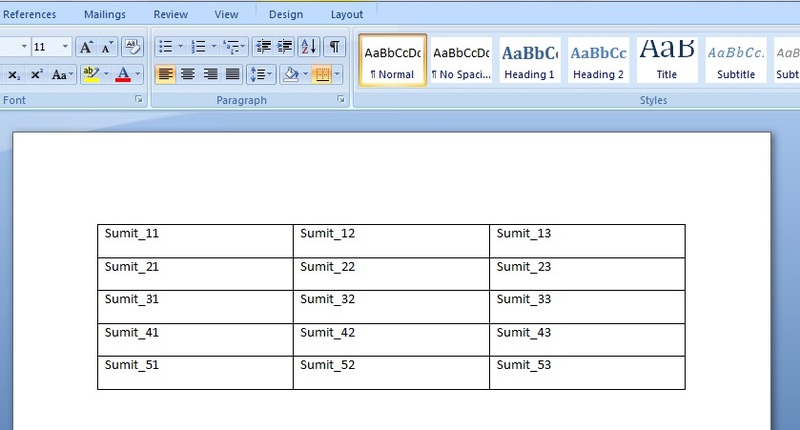 How do you paste a table to an existing word document? Please read these along with this articles,,,, do let me know if you are still stuck..
objDoc.Tables.Add objRange, intNoOfRows, intNoOfColumns ,,, this way you can define your table size. And for filling different data in each row, while iterating through rows you can fill wat ever data you want. I have a list of colon separated strings ( I.e. Abc: def, ghi: jkl) that I want to loop through, set the text to the left of the colon as column heading ( I.e. abc, ghi), set text to the right of the colon as column value (def,jkl). Any ideas? It will solve for you. Please let me know for further queries. For horizontal alignment in specific cells I have found many online variations however none of them seem to work. Does anyone know how to horizontally align the text in “objTable.cell(1, 1)” to the right? The same counts for a border around a specific range of cells. Does anyone know how to add a border around the first five cells in the first column? This is what I currently have, does anyone know what to add in order to change the horizontal alignment? How to insert 2 different tables? I’m having a problem creating the 2nd table and it seems like it overwrites the 1st table. Thanks! 227 queries in 0.102 seconds.